Discover Medjugorje while staying in hotel Sebastian Medjugorje. The place of the first apparitions of Our Lady, several hundreds meters above the Bijakovići hamlet called Podbrdo, is today called Apparition Hill. 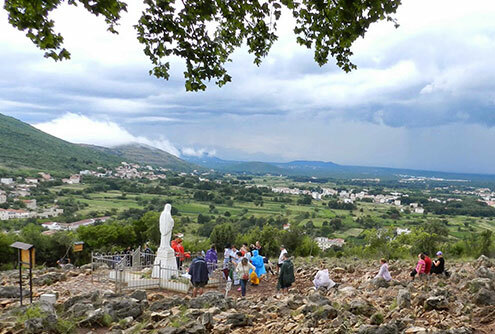 A steep path leads from the houses to the very place of the apparitions, along which – in 1989 – bronze reliefs were placed representing the joyful and the sorrowful mysteries of the Rosary (the work of Prof. Carmelo Puzzolo). On the way towards the place of the apparitions, a large wooden cross was erected, signalling the place where – through Marija Pavlovic, on the third day of the apparitions – Our Lady gave the call to peace for the first time. At the very place of the apparitions, in honour of the 20th anniversary of the apparitions, a statue of the Queen of Peace was placed, sculpted according to the model of the statue, which you can find in front of the parish church (the work of Dino Felici). For the pilgrims, an encounter with Apparition Hill is encounter with Our Lady through personal prayer and prayer of the rosary. In June 2002, bronze reliefs representing the glorious mysteries of the Rosary (the work of Prof. Carmelo Puzzolo) were placed on the path descending towards the Blue Cross. At the foot of Apparition Hill is the Blue Cross, placed there in 1985. At this place, Ivan the visionary’s prayer group gathers regularly, ever since July 4th, 1982. 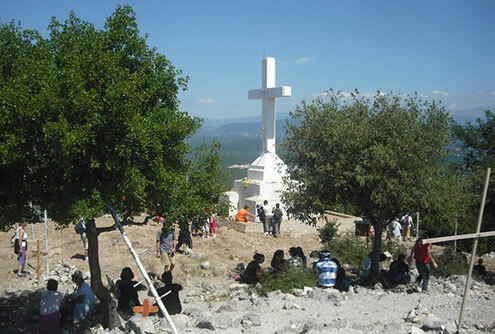 Cross Mountain is a mount above Medjugorje (520 m) where on March 15, 1934, the parishioners constructed a concrete cross 8.56 m high, built in remembrance of the 1900 years since the death of Jesus. On the cross is written: “To Jesus Christ, Redeemer of the human race, as a sign of their faith, love and hope, in remembrance of the 1900 years since the death of Jesus”. Relics received from Rome for the occasion are embedded in the cross bar itself. Since then, the custom was established of celebrating Holy Mass at the foot of the cross in commemoration of the Exaltation of the Holy Cross, on the 1st Sunday after the Feast of the Nativity of the Blessed Virgin Mary. With Our Lady’s apparitions, the faithful started to pray the Way of the Cross on Cross Mountain. In the beginning, the stations were marked with simple wooden crosses, and in 1988, bronze reliefs (the work of Carmelo Puzzolo) were placed there. On each one of them, with the exception of the Garden of Gethsemane, Our Lady is situated. 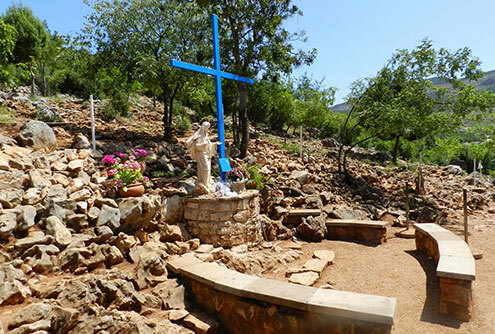 For the pilgrims, Cross Mountain is a call to meet Jesus in His Passion and to discover His love. On the first death anniversary of Fr. Slavko Barbarić (November 24, 2001), on the place where he gave his soul into the hands of the Lord, a memorial was erected: Fr. Slavko’s relief in bronze encrusted in stone. Between two stations of the cross, it will remain as a sign and a memorial of a man who said what he thought and who did what he said, following the Gospel and the messages of the Mother of the Word Incarnate, the Queen of Peace. In 1982, a member of the prayer group was building his house 200 metres below the Blue Cross. Today, this house is the closest to the Cenacolo Community. He wanted to mark the meeting place of the prayer group with a simple cross. From the framework of the house he was building, he and Ivan built a 3ft high cross. In order to protect this cross from the elements, Ivan found some paint that he had at home. He only had blue paint, that is why the Cross is blue! After a while, pilgrims started to gather there. They lit candles, and one day, the cross caught fire. One Italian pilgrim asked Marija the visionary if he could take home this wooden cross and replace it with an identical metal cross. This request was approved. He took a sample of the paint from the wooden cross, and in a laboratory, the contents of the blue paint was discovered and duplicated to paint the new metallic Blue Cross that is there to this day. This Italian pilgrim landscaped the Blue Cross area with the rock formations that you see today. He kept the original Blue Cross at his house in Italy, so that people could pray there.There have been many apparitions at the Blue Cross. It is the most suitable outdoor place in Medjugorje for pilgrims who are sick, old or not physically able to climb Cross Mountain or Apparition Hill, because of its close proximity to the road and it is easily climbed. It is an ideal meeting place for the prayer group when there are not so many pilgrims, especially in winter. The construction of the old parish church was completed in 1897, soon after the creation of the parish (1892). It was a spacious and beautiful construction for its time. Built on unstable ground, it soon started to develop fissures. Immediately after the end of the First World War, the parishioners began to think about building a new church. Construction lasted from 1934 until January 19, 1969, when it was consecrated.St James Church is today the focus and the centre of both sacramental and prayer life, not only for the parishioners, but also for pilgrims. 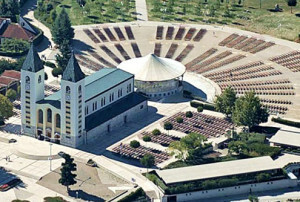 Because of new needs, which surfaced with the coming of numerous pilgrims, the church and its surroundings have been rearranged ever since 1981.The exterior altar built in 1989, and the surrounding prayer area (with about 5000 seats), are a place of gathering in the summer time and for big feasts, when numerous thousands of pilgrims gather in Medjugorje. The Mother’s Village” is a big family which brings together several communities and associations. It belongs to the Community of the Herzegovinian Franciscans of the Province of the “Assumption of the Blessed Virgin Mary” in Mostar, BiH. 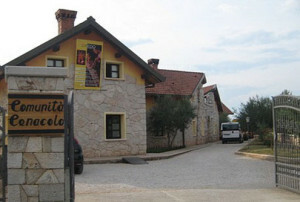 It was founded in 1993, during the war in Bosnia and Herzegovina. 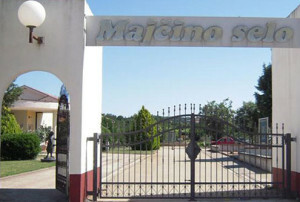 The building and operating was started by Father Slavko Barbaric and the project was aided by the Franciscan School Sisters of “The Holy Family” from the Herzegovinian Province. The Mother’s Village evolved out of the need for protection and care for the children who were wounded by the loss of their homes and parental care during and after the war. It started working officially on September 8, 1996. The Mother’s Village was built and maintained by pilgrims and donors from all over the world. From the imagination of the Holy Spirit, through the intuition of a consecrated woman, Sister Elvira Petrozzi, the Comunità Cenacolo was started in July 1983 as the response of the tenderness of God the Father to the desperate cry of many youth who are tired, disappointed, desperate, drug addicts and non-addicts, searching for joy and the true meaning of life. Collaborating with her are volunteers, consecrated religious and families who live and work full-time and gratuitously at the service of this good work. The Mother House of the Community is found on the hills of Saluzzo, a town in the province of Cuneo (Piemonte region-Italy). Other houses were begun, as well, in these years: there are presently 56 spread throughout Italy and the world. In the places where Providence guides us, we want to be a small but shining light in the darkness, a sign of hope, and a living testimony that death doesn’t have the last word. To those who knock on the doors of the Community we propose a style of life that is simple, family-oriented, in the rediscovery of work seen as a gift, of true friendship and faith in the Word of God, made flesh in Jesus Christ dead and risen for us. We believe that the Christian life, in its fullness, is the true response to every anxiety of man, and that no one other than He who created man, God the Father, is able to reconstruct his heart led astray in a life without meaning. Our strength must come from Love, that Love which comes from the Cross of Christ and which gives life to the dead, freedom to prisoners, and sight to the blind.We are the first to be amazed by what the Lord is working in front of our eyes, and to thank Him because He makes us daily witnesses to His Resurrection, in the strength of which we see every day life return in the smiles of people who had lost all hope.